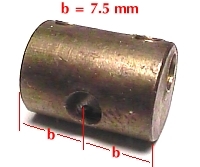 The AB coupling is a lathe-turned and machined brass cylinder 15 mm long and 11 mm in diameter. Two holes are drilled through the cylinder at 90º to each other; these holes will accommodate standard Erector axles rods. 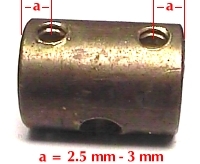 Three set screw holes are threaded into the cylinder to secure the axles; these holes accept standard small Erector set screws with heads. 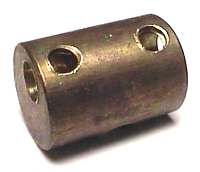 Axle holes, set screw holes and set screws match those in the P15 coupling. 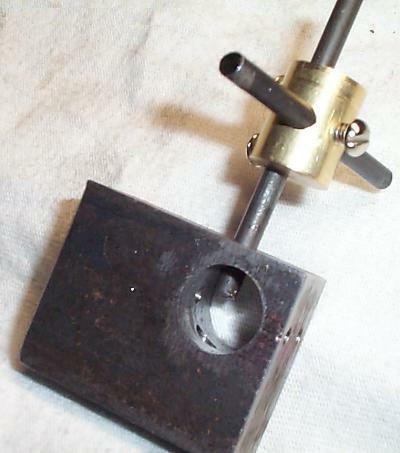 Using the specifications and photos shown above, Girders & Gears contributor Michael VanValkenburg crafted a custom jig for reproducing the AB coupling. The jig, and its final product, are shown in the photo below.